Be the first to share your favorite memory, photo or story of Gary. This memorial page is dedicated for family, friends and future generations to celebrate the life of their loved one. 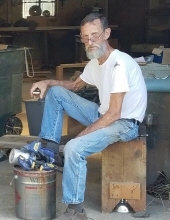 Gary W. Cooper, age 75, of Lawrenceville, GA, peacefully passed away Saturday, January 27th, 2019 at his home with his loving family by his side. Funeral services will be held on Thursday, January 31st, 2019 at 1:00 p.m. in the Peachtree Corners Chapel of Crowell Brothers Funeral Homes & Crematory with Rev. Steve Pritchett officiating. Interment will follow at Peachtree Memorial Park, Peachtree Corners, GA. The family will receive friends on Wednesday, January 30th, 2019 from 2:00 p.m. until 4:00 p.m. & 6:00 p.m. until 8:00 p.m. at the funeral home. Gary was born January 12th, 1944 in Heflin, AL, to the late Harold W. And Essie Videra “Sally” Cooper. Gary proudly served in the U.S. Marines from 1961 until 1964. He was a member of Temple Baptist Church and was the Owner & Operator of Cooper Cabinet Shop for over 50 years. He was an avid outdoorsmen, loved listening to Elvis and singing Karaoke. The times dearest to Gary’s heart were the moments he spent with his precious grandchildren. Gary was preceded in death by his loving wife of 48 years, Pauline Jackson Cooper; brother, Robert Morton Cooper. He is survived by his children, Rodney Willis Cooper and wife Kiri, Norma Cooper Johnston and husband Steve, Lori Cooper Dee and husband Terry; grandchildren, Robi and wife Emily, Erika, Jackson, Gavin, and Becca; sisters, Helen Hall and husband Jerry, Joyce Payne and husband Morris, Carolyn Cooper and husband Paul Evans; as well as numerous nieces and nephews. Online condolences may be expressed at www.crowellbrothers.com. Arrangements entrusted by Crowell Brothers Funeral Homes & Crematory, 5051 Peachtree Industrial Boulevard, Peachtree Corners, GA, 30092. 770-448-5757.y, 5051 Peachtree Industrial Boulevard, Peachtree Corners, GA, 30092. 770-448-5757. To send flowers or a remembrance gift to the family of Gary W. Cooper, please visit our Tribute Store. "Email Address" would like to share the life celebration of Gary W. Cooper. Click on the "link" to go to share a favorite memory or leave a condolence message for the family.